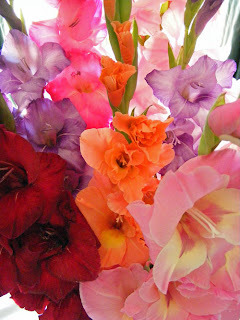 Gladiolus are my favorite flower. Sometimes they are considered old fashioned or a funeral flower. To me, they are the perfect flower because of the huge variety of colors. They are easy to grow in full sun. Best of all, they make wonderful cut flowers that last for days. I just keep pulling off the spent lower blooms and trimming the ends. For Valentine's Day, a couple of years ago, Lenny restocked our gladiolus collection with 160 bulbs! And he promised to plant them for me. Well, that last part got lost in his 80 hour work weeks so I did most of the planting that year. He did dig them up and this year, we did several staggered plantings together. Just a few of the dozens we have already had bloom this year are shown here. So maybe the best part isn't the blooms at all. It is when someone asks "Did you grow those?" I can say, "yes, We did."